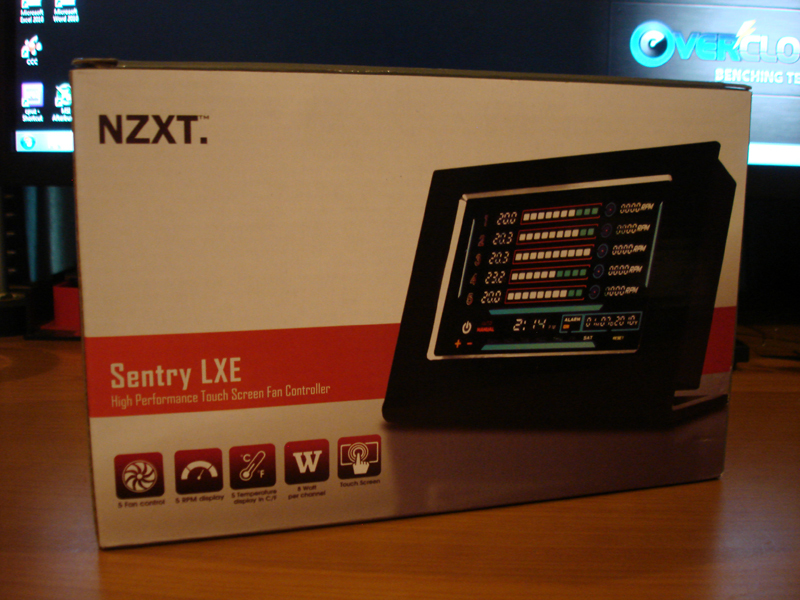 Today, we have a fan controller from NZXT, the Sentry LXE. The Sentry LXE was released about a year ago and our news article featuring the press release can be found here. 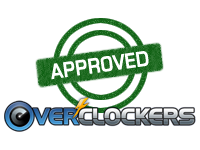 I’d like to thank NZXT for giving Overclockers.com the opportunity to review one of their top fan controllers. 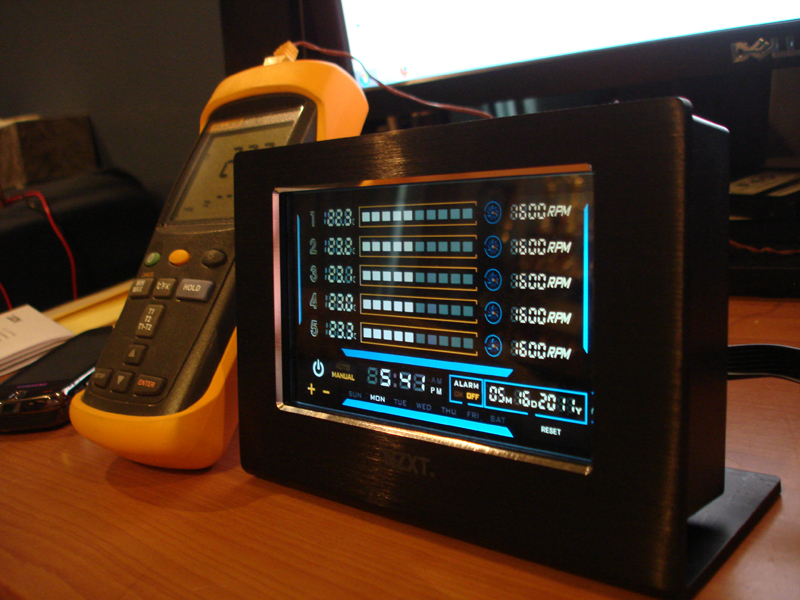 The Sentry LXE is a touchscreen controller that’s very easy on the eyes, but is it all looks? I’ll be putting the Sentry LXE to the test with some high-power fans to see if this controller can perform outside of batting its eyelashes and rendering onlookers awestruck. 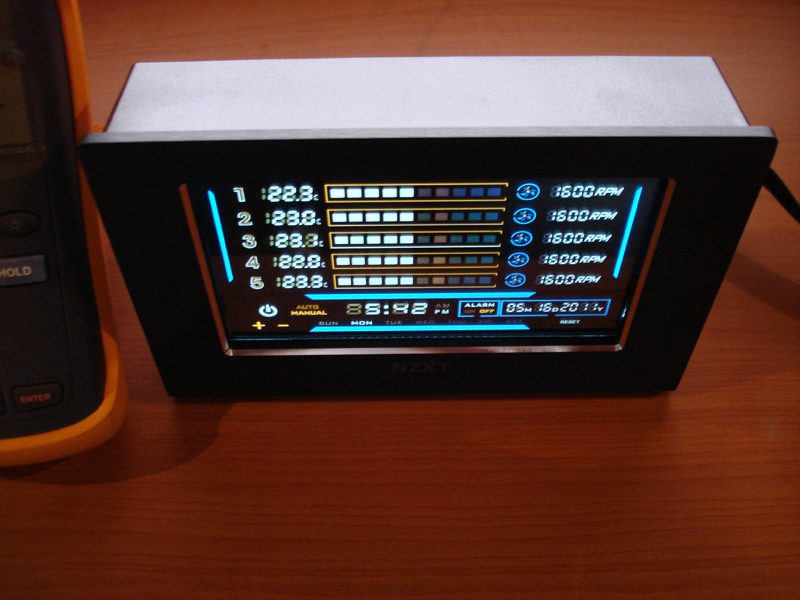 Intuitive Touch Screen LCD – Advanced, touch screen LCD displays temperatures in C/F, RPMs, along with the date, time, and day of the week. Users have the ability to switch the display off for complete darkness for more immersive gaming sessions. Complete Control – 5 Temperature Probes keep tabs on thermals throughout the case while the 5 Fan controllers adjust the fans’ RPM speed for at least 10W per channel. Allows users to automatically adjust the fan speeds to correspond to a specific temperature, manually customize for extreme overclocking capabilities, or set to absolute silence. Temperature Alarm – Instant notification if temperatures rise above a designated point. Sleek Design – Brushed aluminum frame provides sleek aesthetics for any desktop. Rechargeable Battery – The Sentry LXE features a rechargeable battery for up to 500 times, keeping the LXE life time longer without the hassle of replacing batteries constantly. Using a NZXT developed PCI board and external touch display, the LXE allows for more 5.25″ bays freed up for other peripherals.environment. 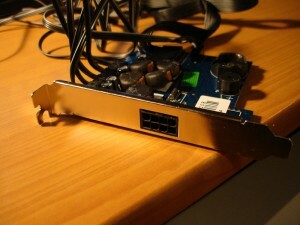 Simply set the fan controller atop your PC or desktop and connect through PCI card interface. There’s nothing “over-the-top” about the packaging. 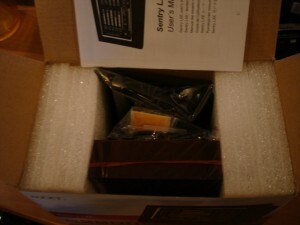 There’s a picture of the Sentry LXE on the front with a few features pointed out at the bottom. On the back, all of the detailed features and specifications are listed in seven different languages. After closer inspection of the box, I noticed a discrepancy in the wattage rating. 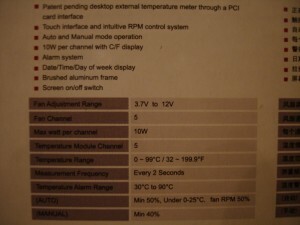 On the front of the box, it says that the controller is rated for 8 W per channel. The specifications on the back of the box and listed on NZXT.com rate the Sentry LXE at 10 W per channel. The display is packed inside of the box much like a case would be placed inside of its box. There’s a piece of foam on both ends of the display to prevent it from touching the box, which helps protect it in case of damage to the box. 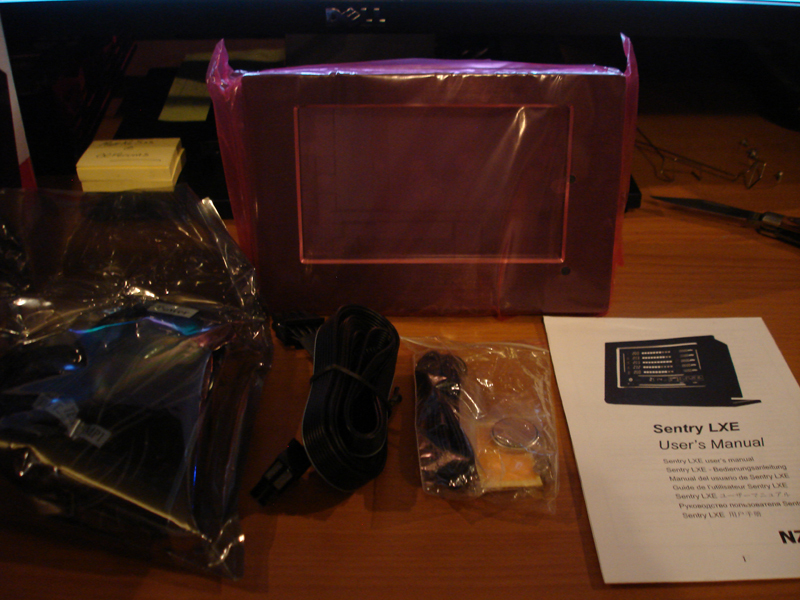 The contents of the box include the display, fan controller, 2 extra temperature sensors, data cable to connect the controller to the display, and the user manual. 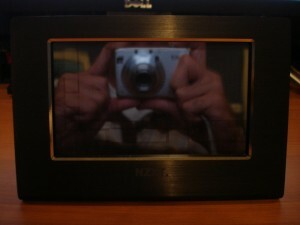 One piece of bent brushed aluminum forms the frame and stand of the display; this makes for a clean and sleek look. The aluminum plate is bent a little more than 90° to give the screen a small backward tilt, which helps viewing the screen since it will most likely be below head level. Attached to the bottom of the aluminum plate are two rubber strips to prevent the display from sliding and possibly falling from its place. Now a few pics of the actual fan controller. 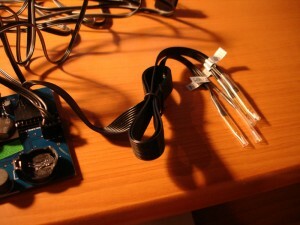 The controller has five 3-pin fan connectors and five temperature sensors pre-installed, but they can be removed if some are unused. 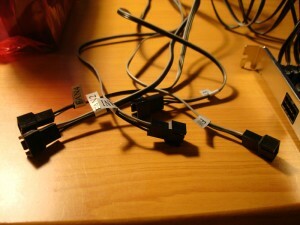 The power connector is a typical 4-pin Molex with both male and female housings. 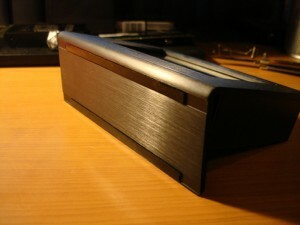 There’s also a battery to keep any saved settings when the PC is off and a speaker for the alarm feature. You’ll notice the data connector is an 8-pin connector much like an 8-pin PCIe/CPU connector, and in fact it is exactly the same as an 8-pin CPU power connector. So, inexperienced consumers be aware that the 8-pin connectors on both the fan controller and the display are not meant for a cable from your PSU. 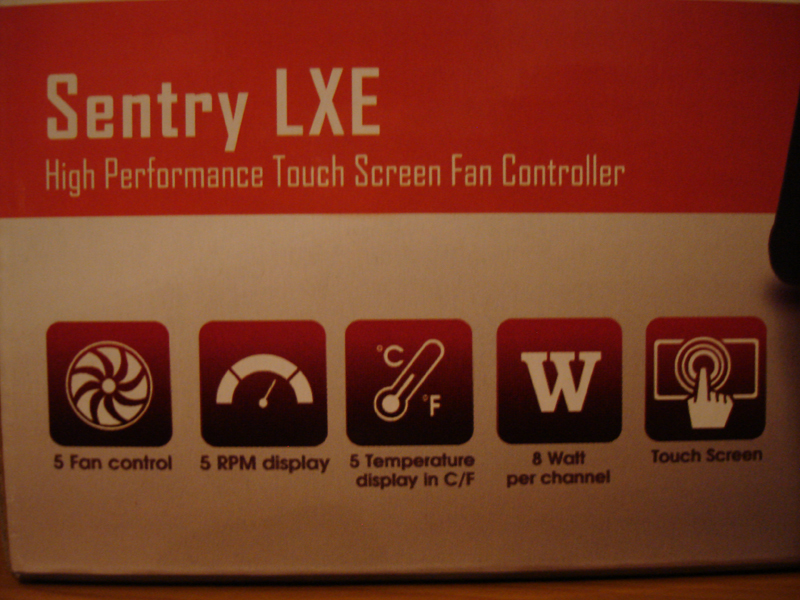 You wouldn’t want to kill your brand new, fancy, touch fan controller would you? The viewing angles on the screen aren’t bad. 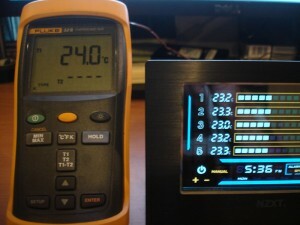 The temperature readings get a little blurry, but I can read the info from all of the angles below without a problem. 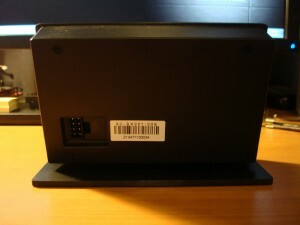 In most cases, the display will be sitting on the corner of a desk or on top of the computer case. 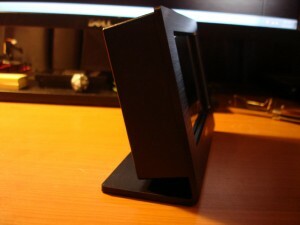 So, there probably won’t be many times when the screen is being looked at from extreme angles anyways. 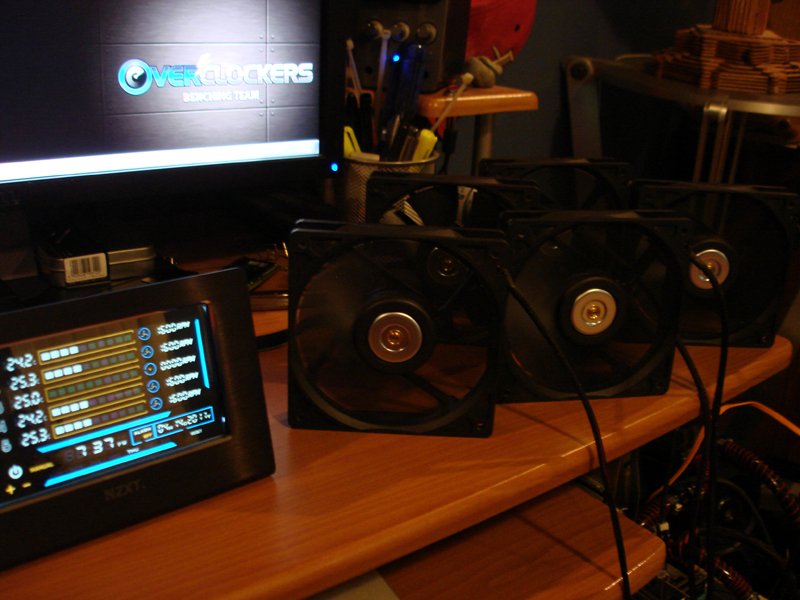 There’s not much to the test setup; just the NZXT Sentry LXE and five Delta AFB1212SH fans. By checking the sticker on the fans the wattage rating for these fans can be calculated as 12 V * 0.8 A = 9.6 W. So these fans seem to be the perfect fit for testing the 10 W per channel Sentry LXE. When I first turned on the fan controller, “Fan 3” never started. 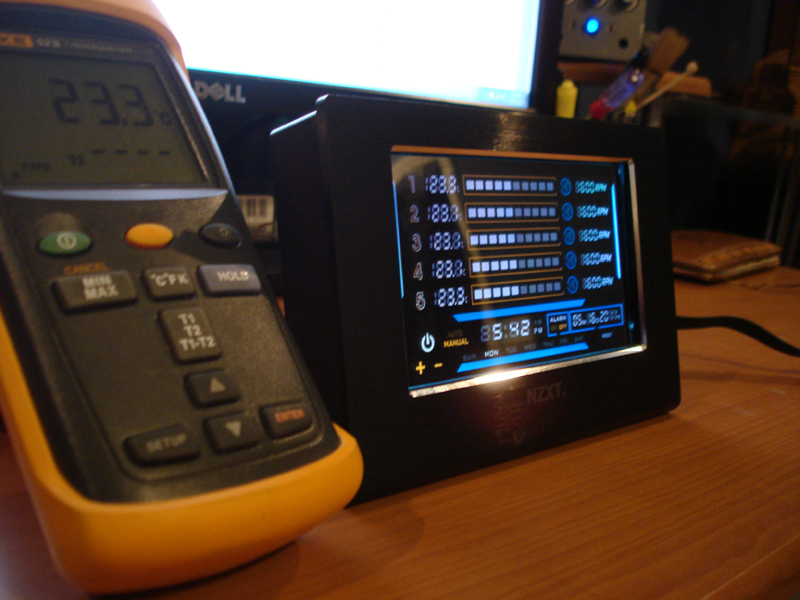 I tried changing RPM on the display, but that didn’t fix anything. So, I figured the fan must not be getting power. 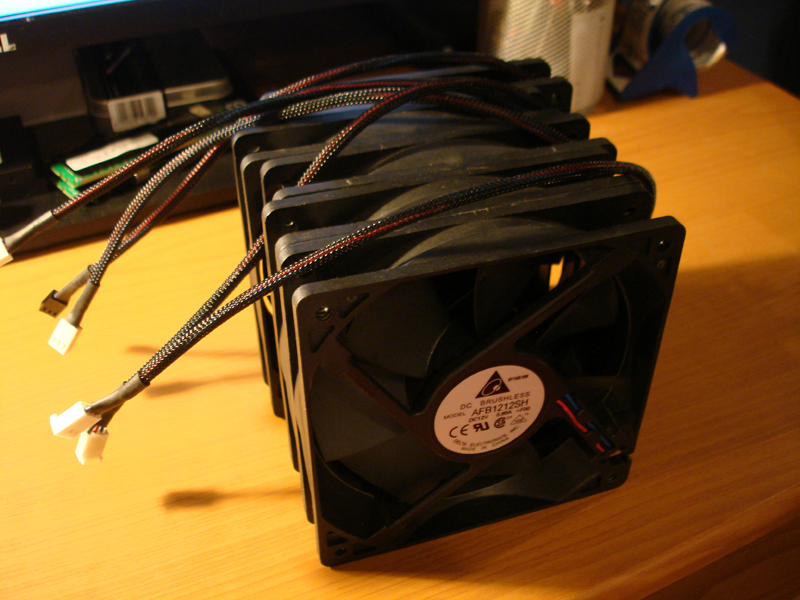 I unplugged and replugged the Molex connector and all of the fans powered up fine. This was an odd issue, so I tried recreating it by unplugging and replugging the Molex a few more times. In five unplug/replug sequences, this issue was recreated once, but with a worse result: only 2 fans were getting power. Depending on where your fans are located, this could be a serious issue. For instance, if one was using aftermarket cooling for their CPU/GPU and one of these random instances happened, then the CPU/GPU would continually heat up until thermal throttling occurs which could lead to system shutdown. 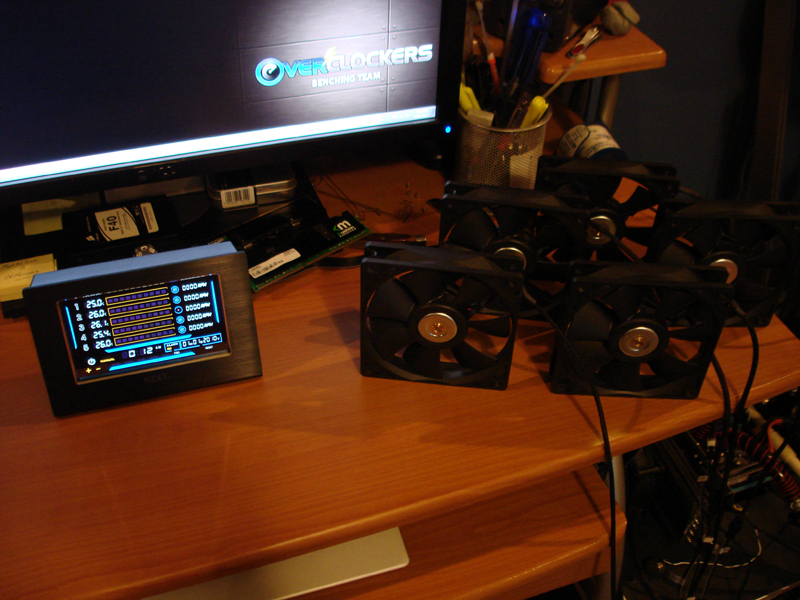 Once I got all the fans running, I wanted to test the range at which the Deltas would run. 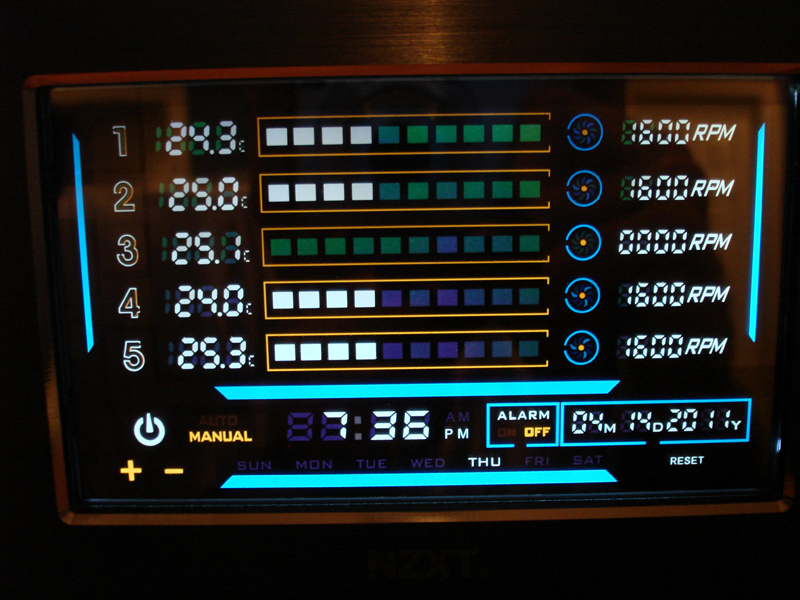 First, I had to touch where the screen shows “Auto/Manual” to set the fans in manual mode. Then, to change the RPM, you have to touch the fan number two times to select RPM (the first touch allows you to set alarm temperature). 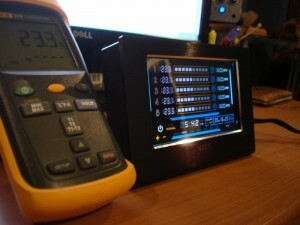 Once the RPM are flashing, touch the “+” or “-” to increase or decrease the value. The minimum was 1400 RPM and the maximum was 3100 RPM, which is 41% to 91%. 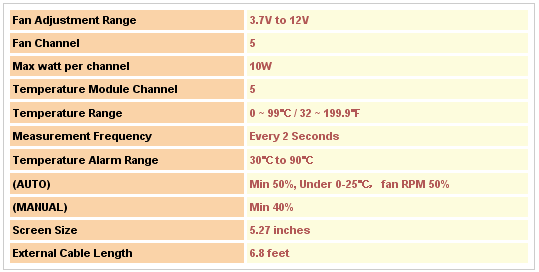 If you refer back to the specifications, it lists 40% as the minimum operation speed when manually setting the fan speed. 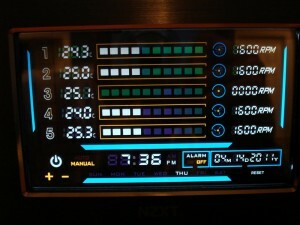 However, the LXE would not run the Deltas at their full speed of 3400 RPM. Finally, I took voltage measurements with a Fluke 115 Digital Multimeter at 100 RPM increments between 1500 and 3000, and plotted that against fan speed. 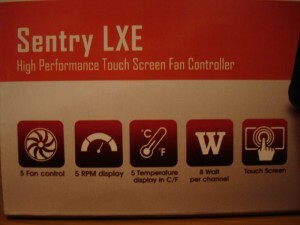 When the controller is set to auto mode, the fan speed will increase or decrease depending on the reading of the temperature sensor corresponding to that fan. 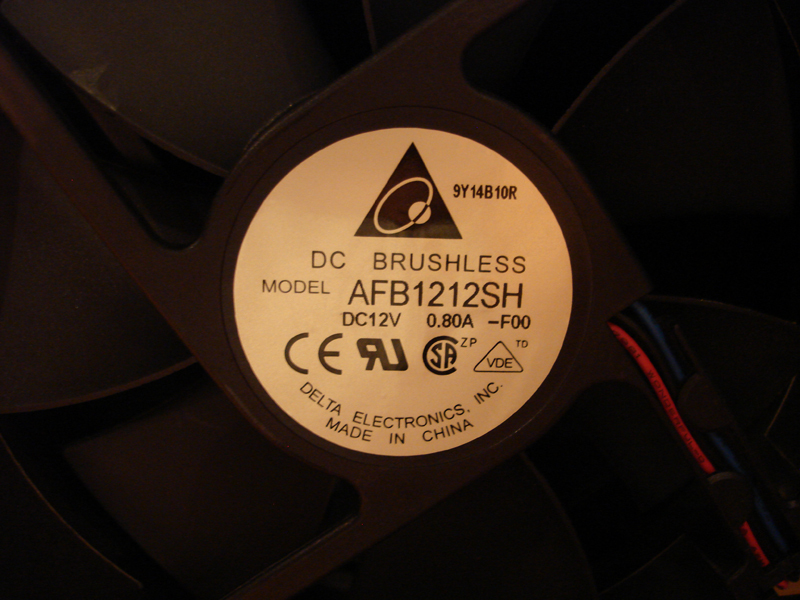 The minimum speed of the Delta fans while the controller was set to auto mode was 1600 RPM or 47%. Fan speed increases as temperature increases, but I’m not sure exactly at what rate it does this. 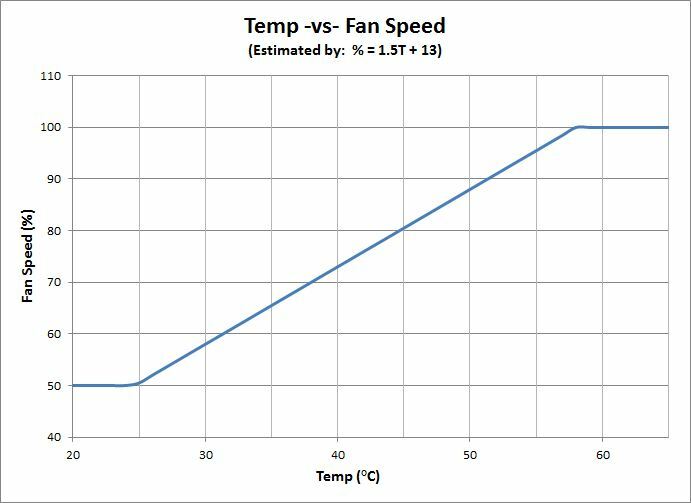 So, I got five temperature -vs- RPM data points by touching various components with one of the sensors, changed RPM reading to a percentage, plotted the data in Excel, got a linear trendline, then used that trendline to estimate the data and create a pretty graph. Of course, this graph is assuming a linear relationship. 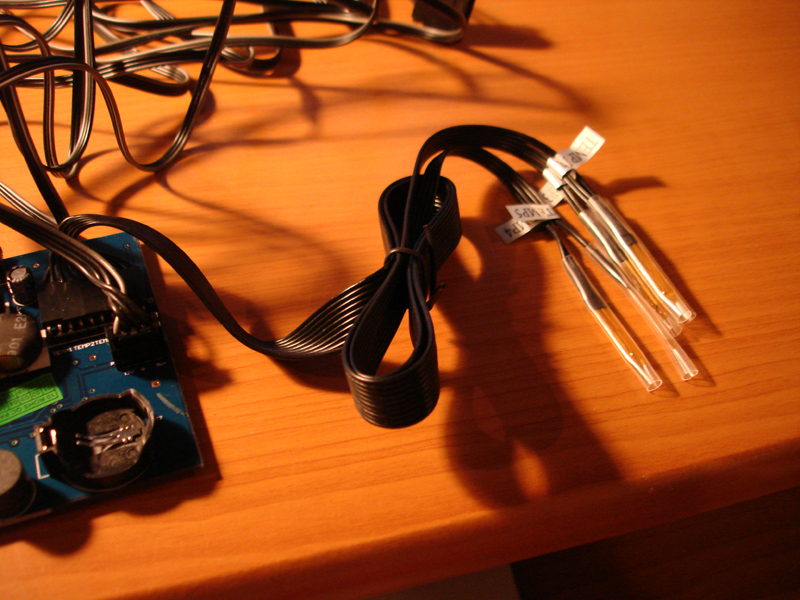 A quick test of the included temperature sensors compared with my Fluke 52 II with a K-type probe shows that the included sensors are pretty accurate. 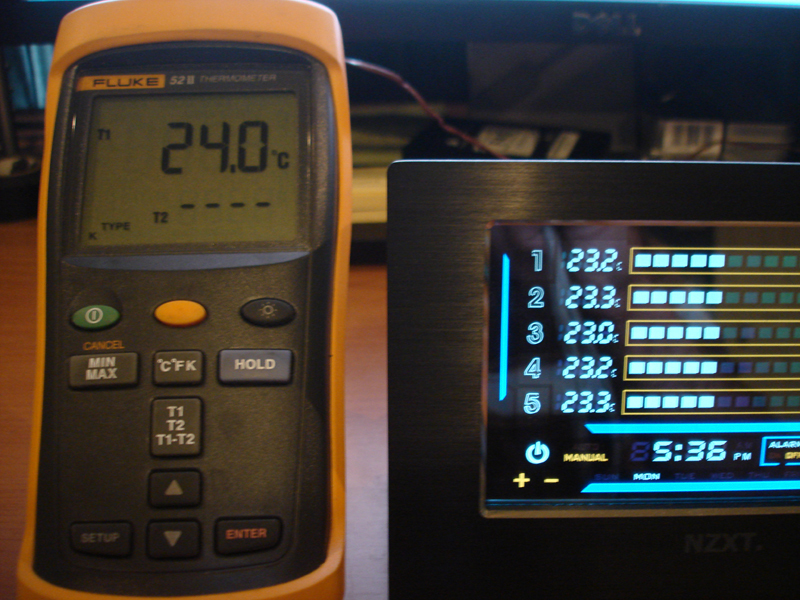 The average difference is ~0.8 °C, then take margin of error into account and you’ll see NZXT included some good sensors. The alarm feature works nicely. To turn on this feature, just touch inside of the alarm box on the display. 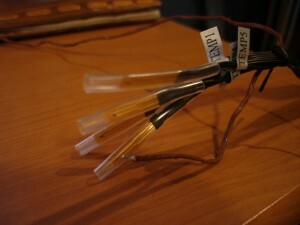 The numbers 1-5 link a temperature sensor to a fan, so 5 means fan 5 and sensor 5. To change the temperature at which the alarm goes off, I had to touch the fan/sensor number once to get the temp to start flashing. Then, I just held the “-” until it got to 30 °C. To test if the alarm worked, I just grabbed the end of the sensor until the temp went above 30 °C. The alarm isn’t one of those that make you need a change of underwear after it goes off like the GPU alarms when you forget to plug in the PCIe power, it’s loud enough and repeats a “beep” for about 5 seconds. When the alarm goes off, the fan correlated to the sensor which is reading a high temp spins up to help get the temperature back down. 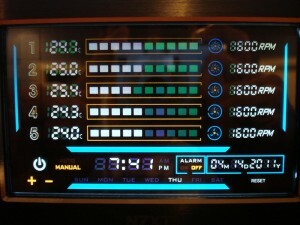 Once the temperature is below the alarm setting, the fan turns back down to the manually set RPM. 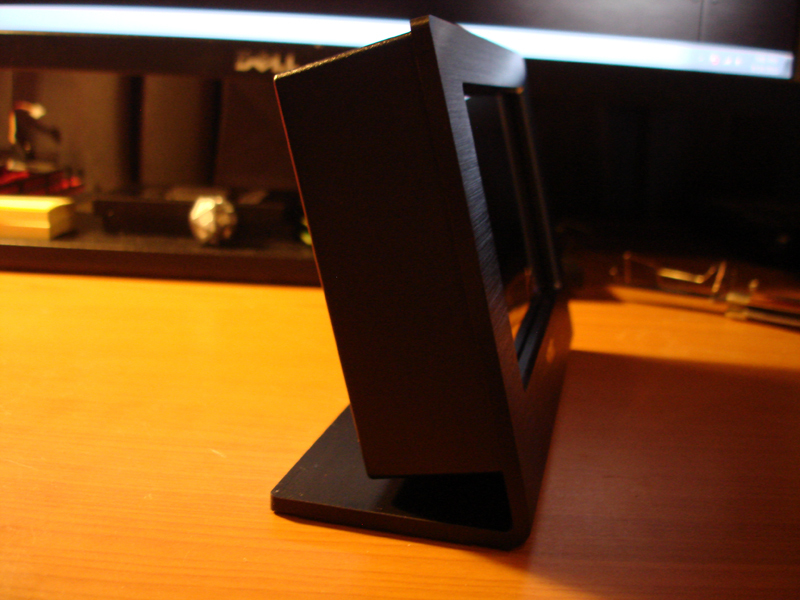 I wasn’t sure if I was going to like a touch fan controller, but I have to admit that the NZXT Sentry LXE is nice. 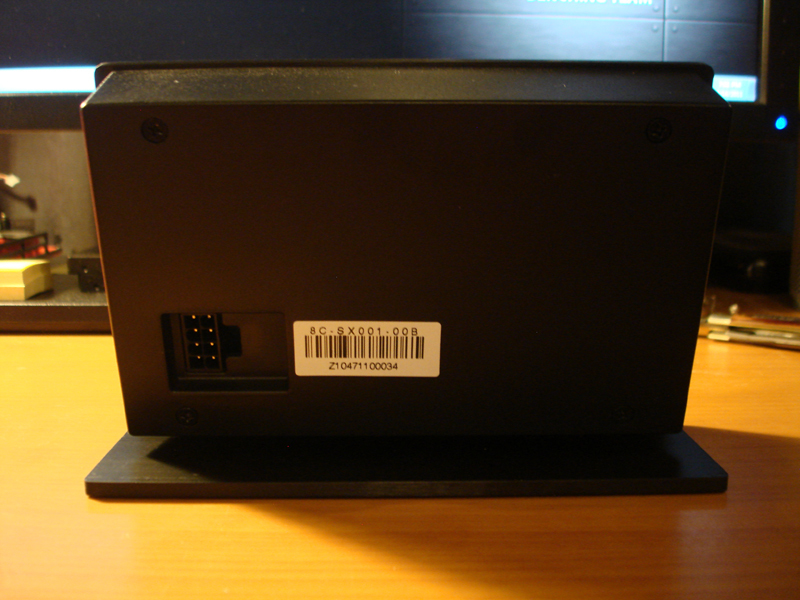 It’s very convenient not to have to bend down to reach a fan controller in a 5.25″ bay. 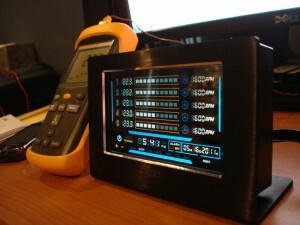 Everything is at your finger tips, figuratively and literally, with the touch display sitting on your desk. You can monitor temperature sensors, fan speed, change settings, and even check the date and time from this user-friendly fan controller. However, there are a few minor issues with this controller. They aren’t a big enough deal to consider them cons, but they’re worth noting. 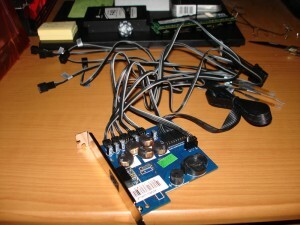 The first minor issue is the data cable between the controller and display uses the same connector as a 8-pin CPU connector. So, someone inexperienced may plug an 8-pin cable from the PSU into the controller or display, which I assume would kill that component. I didn’t test this…haha. 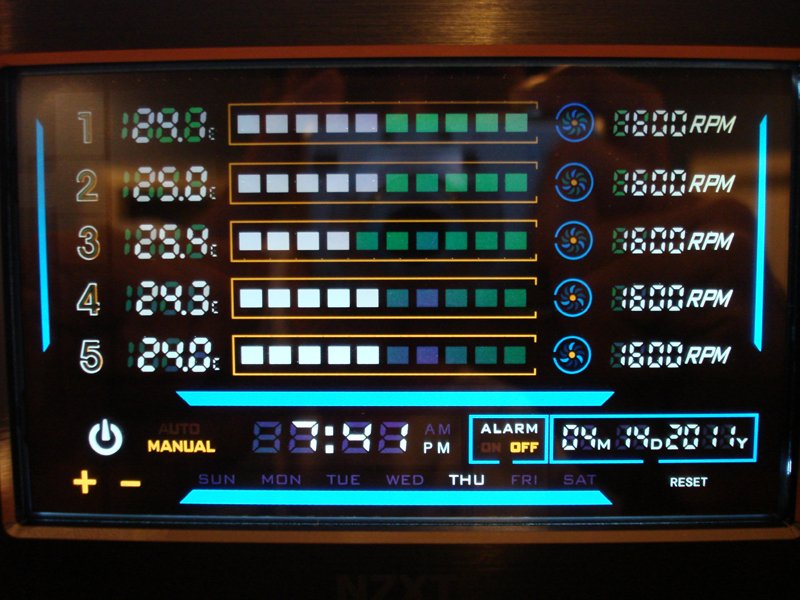 The second minor issue, more of an annoyance really, is that whenever the fan controller is turned on, all the fans spin at max speed then slowly wind down to the set speed. Some people probably couldn’t care less about that, but there will also be some people that this annoys. I happen to be one that it annoys, but I won’t hold that against the Sentry LXE. The last minor thing is the low wattage rating per channel. The Sentry LXE is great for low/mid power fans, but if one needs more than five high-powered fans, then the Sentry LXE just won’t cut it. For example, I have a Black Ice GTX 360, which is a high fin density radiator, with six high power fans in push/pull. So, I would need a little more wattage per channel to satisfy my needs. Now for the bad… The major con that supersedes any pros is that sometimes all of the fans don’t get power when the controller is turned on; which fans and the amount of fans that don’t get power seems random. As mentioned earlier, if this controller is used with CPU and/or GPU heatsink fans, then this could cause serious problems if those fans happen not to spin up. Outside of the power issue on startup, which could be just a result of a defective sample, the NZXT Sentry LXE would be a great controller for most users with low and mid power fans. However, I cannot give the Sentry LXE an Approved stamp based on the results of this sample. The NZXT Sentry LXE is available for $59.99 on Newegg. 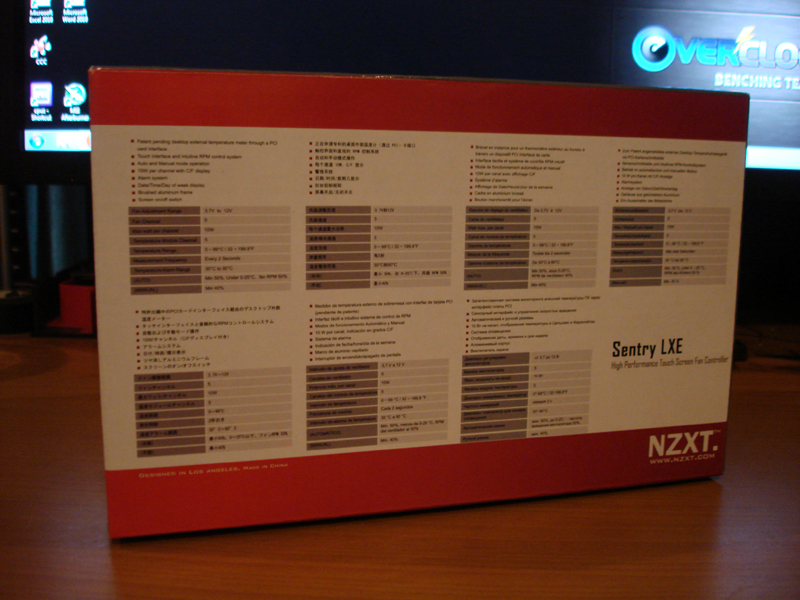 UPDATE [1:30 p.m. – June 20, 2011]: Since this NZXT Sentry LXE review was written, we have had the chance to test another sample of the fan controller. NZXT was certain we received a defective unit and sent us another sample to be sure that’s all it was and nothing more serious that may need addressed. Over the past week or so I’ve done 10-20 on/off cycles per day with the new Sentry LXE, and after over ~100 on/off cycles, I could not reproduce what I was seeing with the first sample. There will always be a small percentage of defective products from any manufacturer making any product, and we were one of those unlucky people to receive a defective product. Since the only real issue with this controller was the effect of a defective product, the Sentry LXE can now wear the Overclockers.com stamp of approval! Its a shame that sample showed those issues, still looks pretty neat. More power /channel would certainly help broaden the market a little bit to the enthusiast level who tend to use more powerful fans eclipsing the 10W mark. If I was building a pretty system I'd get one of these. It's definitely the coolest looking fan controller I've seen. Most of the time, I choose function over looks though with computer parts, so I'd have to take a controller that can handle some screamers! Nice review though! Definitely covered all the bases and more. If anyone has any questions or can think of something I forgot about, then please let me know and I'll post what feedback I can. The second minor issue, more of an annoyance really, is that whenever the fan controller is turned on, all the fans spin at max speed then slowly wind down to the set speed. Matt, I think this is by design, cause if the fan was set on low speed or low voltage, certain fan will not start at that low setting when powered on with that level, thats why they implemented the "kick start" mechanism to boost them at higher speed on the 1st time. Now, probably the "kick start" period is too long that makes it quite annoying, its subjective though, how long does it take for that speed up process ? 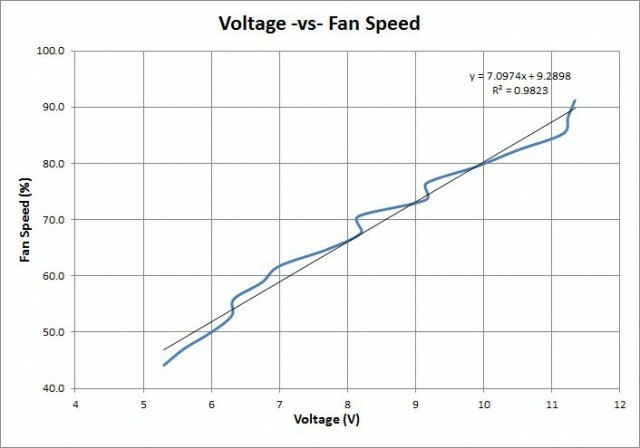 Yeah, some fans have a higher start up voltage than minimum operating voltage. So, you're probably right about the "kick start" mechanism. Of course, the time it takes to spin down to whatever speed is set depends on how low you have them set. I had them set around 1500 RPM, so it would take about 45 seconds for the fans to reach their set speed from 3100 RPM at start up. 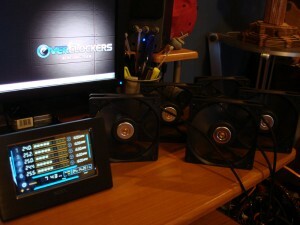 The fans slowly decrease in speed by 100 RPM every 3-4 seconds or so. I could just be used to my FC5V2, which doesn't have a "kick start" mechanism. Added an author update to the article as NZXT sent over another sample since the first one was probably defective. Turns out that was the case, so the product has now received an "Approved" rating from Mattno55s. Thanks for putting in the extra work to test the second sample Matt! 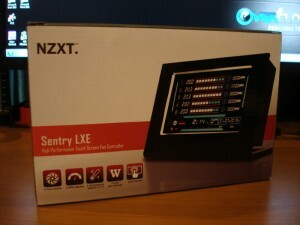 Since this NZXT Sentry LXE review was written, we have had the chance to test another sample of the fan controller. NZXT was certain we received a defective unit and sent us another sample to be sure that's all it was and nothing more serious that may need addressed. Over the past week or so I've done 10-20 on/off cycles per day with the new Sentry LXE, and after over ~100 on/off cycles, I could not reproduce what I was seeing with the first sample. There will always be a small percentage of defective products from any manufacturer making any product, and we were one of those unlucky people to receive a defective product. Since the only real issue with this controller was the effect of a defective product, the Sentry LXE can now wear the Overclockers.com stamp of approval! 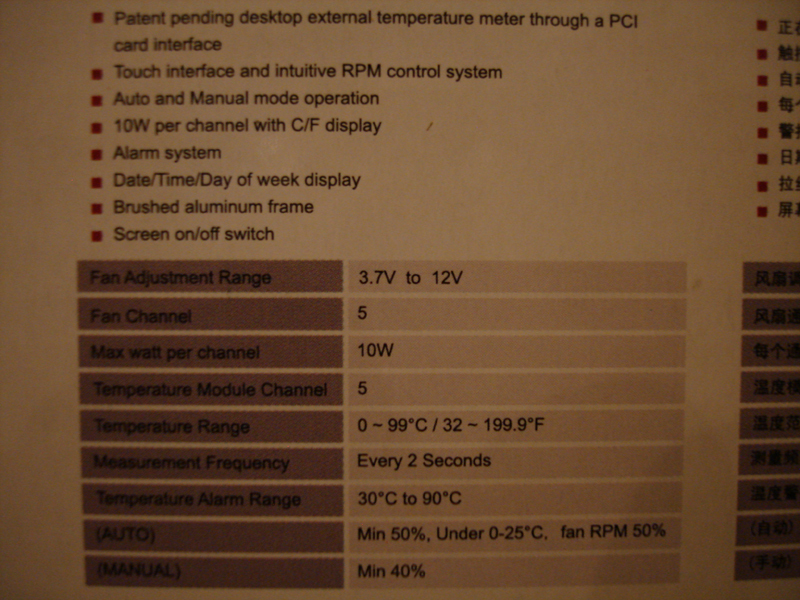 What I would like to know is can I set the temperature for each fan in automatic mode? Hey i bought it today and i recreated the exact same problem on FAN 3 twice. i got a question about the sensors ... do you have any pictures where you taped them? the apropriate places like for CPU , Socket , NB VRM ? i think the sensors are not showing the right temps, and not fast enough ... they might be wrong with 10 to 15 °c ... thats a lot. I've been looking at getting one of these but have been holding off because of several negative reviews. Maybe Im blind but did that article specify what the max wattage per fan per channel was?